It’s September 1970 and The Doors are in a precarious position. 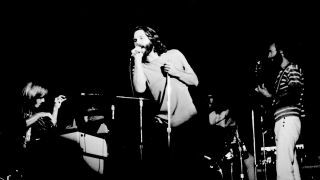 The very real possibility of singer Jim Morrison being imprisoned for inciting a riot and public indecency at the Dinner Key Auditorium in Miami the previous March overshadows them. Promoters refuse to book them and gigs are sporadic; lengthy tours impossible. Having appeared at the Isle Of Wight festival on August 29, they’re back in Los Angeles. While Morrison is constructing an appeal against a six-month sentence and a $50,000 fine handed out on September 20, the rest of the band, Krieger recalls, “are cooling our heels. Lynn Veres Krieger, the subject of Love Her Madly, was a go-go dancer from New Jersey who met The Doors in New York in 67 at the Ondine discotheque – a place frequented by The Velvet Underground and Andy Warhol’s Factory crowd. She caught Morrison’s eye when her falsies slipped out of her bra, and they had a brief fling, before she gravitated to Robby. Lynn and Robby would marry in 1972. Howlin' Wolf Vs The Doors - who sang Back Door Man best? One person who didn’t rate Love Her Madly was The Doors’ long-time producer, Paul A. Rothchild. When The Doors delivered the finished L.A. Woman album to Elektra Records in early 1971, boss Jac Holzman told them Love Her Madly would be the first single. Jim Morrison left The Doors to go to Paris in the same week in March 1971 that Love Her Madly was released. Outside of the studio he only ever sung it twice: once at the Dallas State Fair Music Hall during The Doors’ second set (he was too drunk to make all of the first one), and finally at New Orleans Warehouse on December 12, 1970. These were the last times The Doors ever appeared live as a group. While Jim had less than four months left to live, Krieger can look back on a triumphant swansong with the errant singer, having written the final hit The Doors had in the band’s lifetime. This was published in Classic Rock issue 161.